MacBook Pro with Thunderbolt connector – not the latest model, but with plenty of horsepower for video processing. Wirecast software. 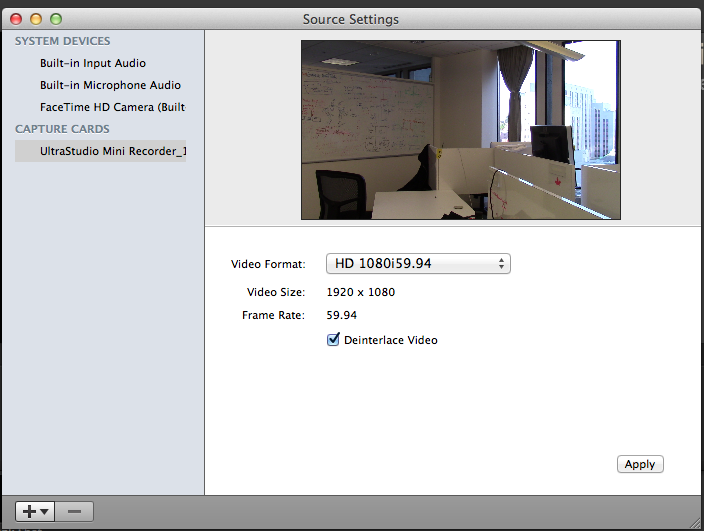 The UStream Producer Pro software I had been using is a customized version of Wirecast, with fewer options. This makes it easier if you’re only going to use it with the UStream streaming service, but the full version of Wirecast offers many more possibilities. Documented below is only the minimum I needed to figure out to do my usual streaming. Videocamera with HDMI output – which is almost any consumer-grade videocamera made today. I got a recent Canon Vixia ($250) which records only to SD cards (32 GB = about 4 hours). This setup assumes that you already have a UStream account with one or more channels you’ve created. Warning: The set of steps below may be incomplete; I have not had much occasion to actually use this setup in production yet. In particular, you may have to do some fiddling to get the UltraStudio Mini Recorder recognized as an input device by your laptop. Attach HDMI cable to the camera’s HDMI port, attach the other end to the HDMI port on the UltraStudio Mini Recorder. Attach the UltraStudio Mini Recorder to the laptop using the Thunderbolt cable. Ensure that the camera is set to record in HD. Go to Sources | Show Sources Settings. Click Apply, and then the red button to close the dialog. Select the new shot to display it in the monitoring window. In Select an Output Destination, choose UStream from the menu, click OK. In the Output Settings dialog, enter your UStream username into the Username box and click Authenticate. Enter the password as requested in the next dialog box. You should then see a list of channels available on your UStream account. Select the channel you want to broadcast on. In the same dialog box, select Add in the lower left. This will again open the Select an Output Destination dialog. This time choose Record to Disk – MP4 from the menu, and click OK – this way you’ll be recording to your local hard disk (as well as the camera’s SD card, if you remember to press the record button on the camera!) while also streaming. Click OK again to return to the main Wirecast window. NOTE: You are not actually streaming or recording anything yet, at this point you have only told Wirecast where you will want to stream and record to! To start streaming and recording (yes, you should do both!) go to the Output menu and select Start / Stop Broadcasting | Start All, then Start / Stop Recording | Start All. (Just because I figured out how. Not sure I’ll actually use this for anything; it only allows 9 people to join a broadcast. In Wirecast, set as shown above. Start a Google Video Hangout. In the video window, select the Settings icon at the top of the screen. 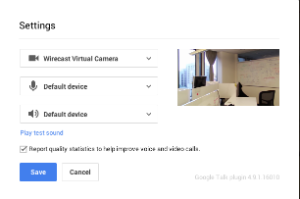 Note that the image you see in your Hangout will be mirrored (yeah, whatever Google), but others in the hangout will see it the right way round, ie text will not be reversed! This entry was posted in videoblogging, what I do and tagged UStream, video, video streaming, videoblogging, Wirecast on April 24, 2014 by Deirdre Straughan. This is how I currently stream and record live video events such as dtrace.conf, illumos/ZFS Days, the OpenZFS Summit, and many, many more. This setup is subject to change, but it has worked for me for some time, and you may judge the results for yourself at any of the above sites. UStream Producer Pro. I use the paid version of the software because it supports HD broadcasting, and titles and layers. I may switch to Wirecast, which is the same software with more options on a few things, such as the format in which your recorded video is stored on your local hard disk. My basic setup has not changed substantially since I wrote this four years ago. You also need a laptop with FireWire input (in my case, a MacBook Pro). I will probably have to change everything soon as my Canon Vixia is getting old. Tape+Firewire models like the Vixia are no longer in production, and Thunderbolt has replaced Firewire on new MacBooks. UStream account – we pay a modest monthly fee (a bit more for popular events like conferences) to keep our streams ad-free. Attach Rode Videomic to hotshoe on top of camera (it’s just a physical connection, in this case – no electronic interface), tighten the screw. Plug in the mic to the red MIC jack on the right front end of the camera. Plug a set of headphones into the yellow headphone jack underneath that. Your phone earphones will do. Use these to monitor the sound the camera is getting (make sure you turn on the mic). Attach the Firewire cable to the small jack near the power light on the back of the camera, attach the other end to the Mac’s Firewire port. Attach the camera to a power source. Turn the camera setting wheel to “Camera”. If you want to record to tape as well, insert a tape. 1. Open UStream producer, log in. 3. The drop-down list should include your camera, ie Vixia. 4. Use Master Layer 2 to create overlays with names and titles for your speakers. 6. Assuming you have set up channels via the UStream web interface, select the channel to broadcast to in the lower left. 7. 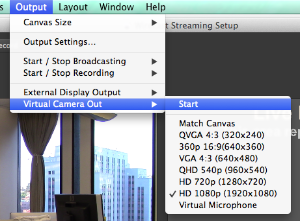 Ensure that Broadcast Settings (center bottom of UStream window) is set to HD. 8. Click Start Broadcasting and Start Recording. If you also want to record to tape, don’t forget to press the Record button on your video camera (but you don’t have to). If using tape, remember to change it every 60 minutes. This will not affect the broadcast stream or UStream recording, but the tape change will be audible. 9. Open the channel URL in a browser to check the stream – using a second set of earphones on your laptop so you don’t create an audio feedback loop! Note that it is not unusual for the stream to lag up to 15 seconds behind realtime. This entry was posted in what I do and tagged UStream, video, video streaming on December 27, 2013 by Deirdre Straughan.